Bigger screens don’t cut it anymore. Now, we need taller screens. I’ve been playing with the LG G6 for the past 24 hours. In many ways, it is just another phone. But the company is trying something new with a 2:1 aspect ratio display — essentially a normal 16:9 display that can fit a few extra lines of text at the top and bottom. And it makes a big difference. At first, I was quite skeptical about this new format. For instance, if you watch a video, there are narrow black bars on each side of the video. And I’m sure many games haven’t been optimized for this aspect ratio. But in real life usage, the taller screen makes a big difference. My main phone is currently the iPhone 7. While I’m always impressed with the iPhone 7 Plus, it’s just too big for me. It doesn’t fit in my pocket, it’s hard to type with one hand as the keyboard is too large. I understand why people love those devices. But I have tiny hands and this kind of phablets is not for me. 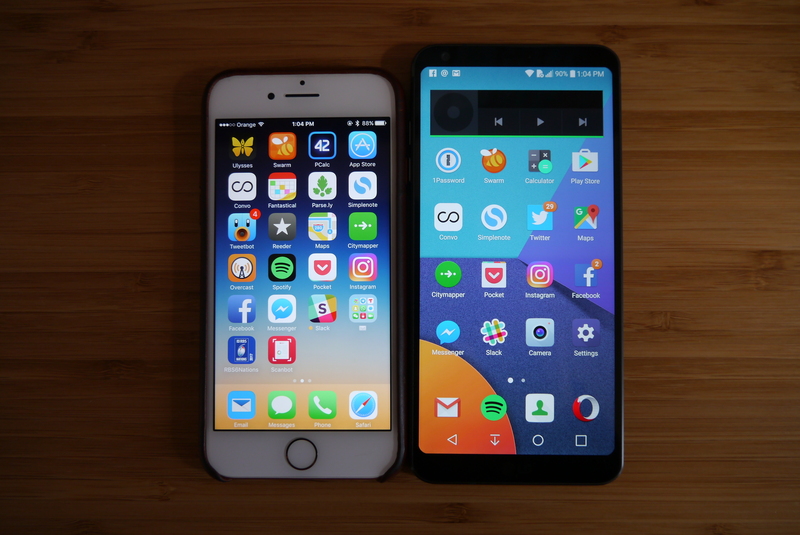 The G6 is roughly as wide as my iPhone 7 with Apple’s case. It’s just a tiny bit taller. But when you turn those phones on, LG’s phone feels much bigger just because the screen takes over the front of the device. When you read an article, when you browse your inbox or when you look at a map, you can fit more content on your display. It just feels like a more efficient device with less wasted space. Sure, the camera is also better, the chip is faster, the body is waterproof, and there are a few nifty software features that take advantage of the display. But nobody cares about specs anymore. People are just going to remember one thing — the G6 has a taller screen. While LG is the first one coming up with this new format, LG isn’t an outlier. Samsung’s Galaxy S8 will also have a 2:1 display — essentially two squares on top of each other. And rumor has it that the iPhone 8 will also have a taller display without necessarily making the phone significantly bigger. In other words, it’s time to get rid of the bezels. There will always be a tiny bezel for the selfie camera, but there’s no reason to keep those thick bezels in your current phone. It makes it much more comfortable to hold a phone with a large screen because it’s still quite narrow. I’m excited that I finally feel comfortable using a phablet. LG didn’t necessarily come up with the most exciting phone of the year. But the company is paving the way for a new generation of phones, educating users and app developers about taller screens. And I can say for sure that these new aspect ratios are the way of the future.